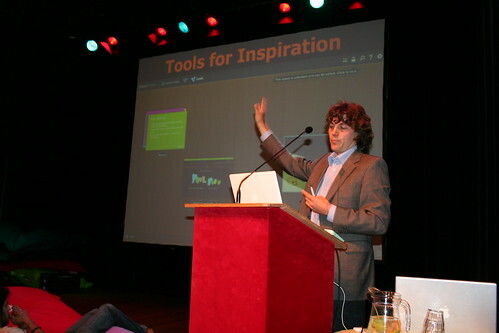 On Saturday, June 14, 2008, Ianus Keller gave a short presentation at Interesting Amsterdam on Cabinet, Tools for Inspiration and my latest software tool for inspiration. Originating from London with Russell Davies as the initiator, speakers are invited to talk about interesting topics, without the constraints of a specific subject or target group. Everything is intentionally kept vague with some very famous speakers, who will talk about unexpected topics and some unknown speakers that talk about a very specific fascination they have. The meme of Interesting has spread out and in Amsterdam Jeffre Jackson and André Bouwman set up a nice event over at De Balie with an interesting list of speakers. As you can see, my name is not on it, but luckily a day in advance I got an email from Jeffre, saying that I was put on standby and was given a spot at the end of the day. All in all, it was a nice and fun day with an eclectic set of subjects and some cool lounging in beanbags. Some of the videos are now available online and I hope I will be able to embed my talk here as it gets published.